Now that the trailer for the Ghostbusters reboot has hit YouTube, everyone’s had their dreams of a return to ghostbusting form crushed just a little bit. Even though the first half of the trailer is mostly Easter eggs for the fans, it’s really kind of a lame Ghostbusters reboot trailer. From Leslie Jones being saddled with playing a cliche to a whole lot of slapstick comedy, most of the scenes in this trailer should give anyone who was hoping to see an awesome new Ghostbusters movie a big case of the uh ohs. Keep reading to see the lamest moments in the new Ghostbusters trailer. Most film buffs know that it’s really hard to judge a film by its trailer, even the original Ghostbusters trailer isn’t spectacular. But based on this one, it's reasonable to worry that 2016 is the year of the unfunny Ghostbusters remake. For whatever reason, the film’s director (Paul Feig) appears to rely super heavily on gross-out humor, overblown visual effects, and jokes that even the hackiest of comedians wouldn’t dare use in the 21st century. Maybe it’s a gamble that will pay off, but judging by these lame moments from the new Ghostbusters trailer, this reboot might not live up to the original. Vote up the biggest signs that the Ghostbusters remake is in trouble, and then tell us which moments in the trailer stuck out to you. Why Can't Leslie Jones Be a Scientist? Surely nobody meant to be racist when he cast the hilarious comic Leslie Jones as a sassy black woman who works for the MTA. But the fact that the fairly forward thinking filmmakers who went out of their way to make a movie with as many women as possible, still see African American actors as street-smart loudmouths feels a little insulting. There are hundreds of ways that they could have written Jones's character, and any claim that she's the "everyman" of the group is either a placation tied to a reverence for the original film or it's just lazy writing. That's Going to Leave a Mark! Almost all of the super lame moments from the trailer are forgivable, but the "That's going to leave a mark" joke is such a hack joke that it feels like it's from 2003. Are we seriously supposed to accept that the creator of Freaks and Geeks couldn't think of a better joke? Every five years or so, films with a lot of digital effects all start to look samey, which is in part because there are only so many visual effects companies, and also filmmakers like the look of something and they want to put their own spin on it. 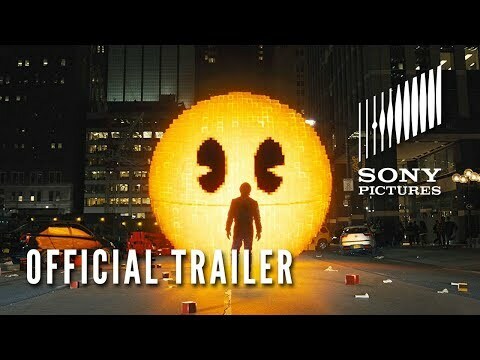 Unfortunately, director Paul Feig seems heavily inspired by the Adam Sandler movie Pixels. Hopefully, since Pixels was basically Ghostbusters with video game characters, the reboot will have at least some semblance of a Ghostbusters film. We get it. Chris Hemsworth is just meant to be eye candy and Paul Feig put him in glasses to be ironic. But what's the point? The guy's a hunk, let him be a hunk! You're not fooling anyone Hemsworth.